We met Cru through connections in North Carolina, where he was going through rehabilitation after surgery. 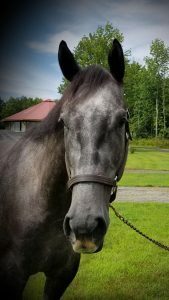 This handsome grey was originally purchased for eventing, but sadly a severe stifle injury required surgery with a lengthy rehab to follow. 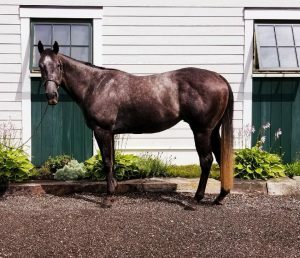 Horses with Hope acquired ownership, with the hope of fully rehabbing Cru. If successful, he will be the first member of our new "Horses helping Horses" program: we will eventually sell Cru to the perfect home with all proceeds going straight to the rescue. At this point, Cru is on a reconditioning routine, and we are carefully building him back up under saddle. Currently he does 20+ minutes in trot sets and a few laps of canter under saddle. He is also learning to carry himself with a bit of contact, and to stretch and soften over his back. When possible, we walk him out in hand on the trails to begin building him up on terrain. As of December, Cru is on regular turn out with other horses, and no longer requires any sedation. This boy is super sweet and personable, but at only 4 years old, he has a lot to learn! We look forward to continuing with his conditioning and education.